I've just issued a publishing plan for the week on Flooring The Consumer. Monday: A recap of Liane Evans' MarketingProfs Digital Marketing Mixer 09 presentation titled "Blending Social Media and Search" during which she touched on bathrooms. 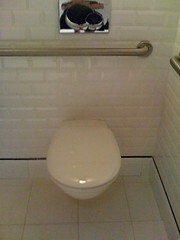 Tuesday: Listening to customers showcases bathroom innovation and creativity - a sure way to Flush The Recession, right? Wednesday: Another recap from the MarketingProfs recent Digital Mixer 2009 in Chicago. This time of BJ Fogg, who brilliantly shared with us epiphany-persuasion moments that happened to have taken place in -yes, you guessed it- a bathroom during his keynote presentation titled "Design For Behavior: Why Facebook & Twitter Are Winning." Friday: How green and simplicity express themselves in bathrooms. 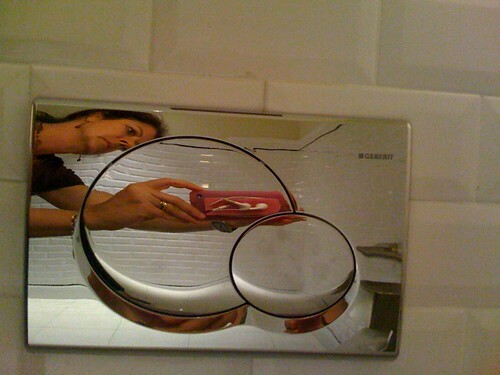 And, now, here is the first post for this week's event: David Reich's Bathroom Blogfest post titled Going on the Go. 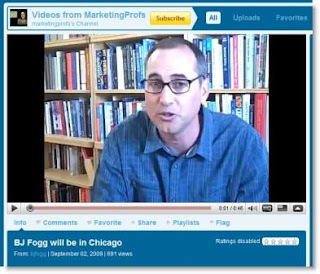 My latest post on the MarketingProfs Daily Fix appeared on 10/6/09. 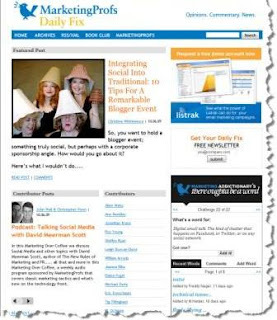 It's titled "Integrating Social Into Traditional: 10 Tips For A Remarkable Blogger Event." The genesis for this post was a blogger event I attended earlier this year. Having taken part in several blogger events, I had high expectations for quality interaction, for well-thought out details, for traditional basics, in what looked to be classier surroundings than normal. Although I met a charming person whose conversation about his products inspired me, I was disappointed. The event could have been so much more than it was -- regardless of whether it was blogger focused or not, and even moreso given the blogger angle. I'm a practical marketer. I'm also intensely optimistic and like to learn from situations. My solution to this type disappointment is to think through events I've organized and attended, compare and contrast them [something I learned to do well studying Art History at Smith College], and compile a list of Tips that integrate social into traditional and pave the way for an Outstanding Event with Bloggers. Do others come to mind? Note: Thank you to PerkettPRsuasion for including my article in their Persuasive Picks for the week of 10/5/09! Kinnelon, NJ – The 2009 Bathroom Blogfest, now in its fourth year, brings together 20 bloggers from the U.S., Canada, the UK and India who will post at least once on some aspect of the theme: “Flush the Recession and Plunge Into Forgotten Spaces.” A blogfest gathers writers who direct their posts around a single subject while making the subject relevant to their readers. Between October 26 and 28, these experts in marketing, customer experience and service, public relations, library sciences, life, retail—toilets and bathrooms—will call attention to improving the overall bathroom experience. "Kaboom, the Blogfest’s first sponsor, will play a part in some of the blogs," said Christine Whittemore, who manages the Blogfest. “The brand is adventuresome and innovative, volunteering to take its chances with this social networking experience,” said the chief simplifier of Simple Marketing Now, Kinnelon, N.J. “Kaboom has sent its cleaning products to nine writers whom we expect to report on their findings. Some may also add Kaboom giveaways/contests to their coverage.” Information about the products reviewed and given away as prizes can be found at http://www.BathroomBlogfestDeal.com. Along with a sponsor, Whittemore added to this year’s initiative a Bathroom Blogfest Facebook Fan Page and way to keep up via Twitter: @BathroomBlogfes. In addition, to monitor the conversation, photos and posts, look for the tag “#ladiesrooms09” on flickr, del.icio.us, Technorati, Twitter and Google. 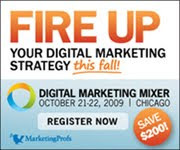 For more information about the blogfest visit http://www.BathroomBlogfest.com or contact Whittemore at cbwhittemore@SimpleMarketingNow.com. For information about Kaboom, visit http://KaboomKaboom.com. Happy Blog Action Day 2009! It happens every year and, thanks to the involvement of bloggers from around the world - 7,656 blogs from 140 countries with 11,521,123 readers as of 11:05pm 10/14/09 - who all publish about the same topic on Blog Action Day, it draws attention to a cause that matters to us all. This year it's Climate Change. I don't know about you, but I consider the notion of Climate Change and my ability to play a role in it overwhelming. Simplify and consider the matter from a smaller, more actionable perspective where through my actions and decisions I can play a part in effecting change and affecting Climate Change for the good. My friend Rich Nadworny - who took part in my Bridging New & Old interview series - sent me a link to an article titled How Simplicity Can Help Creativity, Briefly. The article explains how complication gets in the way of thinking clearly, productively and creatively. 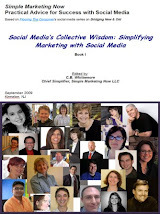 And it offers 11 worthwhile suggestions on how simplicity can help with creating solutions. Certainly appropriate for a topic like Climate Change and others! My favorite suggestion: "When you're overwhelmed, focus on less." Given that I'm a practical marketer, I decided to focus in on practical, searching on practical solutions to Climate Change. I came across Climate Solutions - Practical Solutions to Global Warming and Common Sense on Climate Change: Practical Solutions to Global Warming from the Union of Concerned Scientists. Since I was intrigued in how we get our children involved [a topic I cover for Blog Action Day in the Smoke Rise & Kinnelon Blog in Climate Change & Kiel School] I thought Be part of the solution and Teaching Climate Solutions looked particularly worthwhile. 6. Eat Smart, Go Vegetarian? Perhaps all aren't options for you at the moment, however, being aware of them and thinking about them allow you to focus in on the one or two changes you can put into effect that mean that we are a few steps closer to Climate Change. I'm consciously trying to drive less; I've moved as close as I possibly can to work; I'm definitely consuming less and maximizing efficiency. I hadn't thought about the ramifications of going vegetarian. I hope that all of the paper I recycle [which is terrific to use with clipboards] has saved a small forest; and I have one child. I'll try to unplug although that's a tough one. How 'bout you? How do you plan to simplify so you can take part in doing good for our world? Happy Blog Action Day 2009! PS: This article from the Fall 2009 issue of Smith Alumnae Quarterly describes "Greening the roof of a 'green' building. Ford Hall's environmental focus starts at the top" which looks to be the beginning of a magical solution for insulating the building's roof and managing storm water. How Do I Create Content? 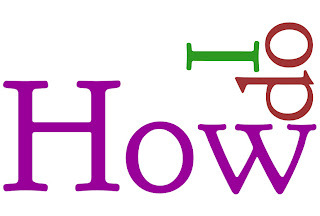 is a question that comes up when I discuss online visibility and the importance of creating content to tell your story and connect with online visitors. It further came up in an email exchange with Jeff Branch who writes I Like Carpet! Blog. Jeff noted that many organizations, including small businesses, don't know how to manage let alone create new and engaging content that connects with potential online customers. You see it is critical for a business to have unique content online. Especially if that business is serious about being found online by potential customers. And then, once found, if you want to be perceived as trustworthy and customer-focused, committed to connecting with those potential customers. The best way to do that is through content that tells your unique story -- not too different from what your store experience should communicate and what your brand should embody. Right? Let's start with your website. Most important of all, make sure your content is yours and yours alone. Even if you are discussing basic information about product, make sure it's YOUR content written in your own words. Especially if you are an independently owned business, and even if you are affiliated with a national buying group. Although I consider a website more formal than a blog, it should still communicate your story. Information about who you are, how you got started in the business, what makes you special, and nitty gritty details about your business [i.e., hours of operation, address, phone numbers...]. On a website, I want to know something about your corporate history. I want to see pictures of the principals. I also want to see signs of life - that your website is up-to-date and that you are adding new and relevant information. Include press releases; they indicate that you're up to something in the marketplace and that you're excited about what you're doing. For example, the Carpet and Rug Institute Blog shares the history of the CRI, celebrates carpet cleaning success stories, and debunks myths. All stories relevant to carpet customers wanting to know more about the CRI and how carpet "benefits life, health, learning and the environment." My personal blog, The Smoke Rise & Kinnelon Blog, details local hikes and articles written in the late 1980s about local history, highlights local happenings and welcomes guest contributions. All stories relevant to those living in the immediate geographic area and with a connection to it. Two very different but rich content examples, with unique stories that engage a visitor to whom the information is relevant and who may want to have a conversation about it. Although the majority of The Smoke Rise & Kinnelon Blog subscribers reside in the immediate Kinnelon, NJ area, some live as far as California and North Carolina. The content matters to them; many have left comments or sent emails. These content principles - unique, fresh and consistent content that tells a story relevant to your readers and doesn't shout - holds for other digital communication tools like Twitter or Facebook. Fresh, relevant content sets the stage for building a relationship with visitors. You may think that you couldn't possibly come up with enough fresh content. You would be surprised! I consider it a matter of loosening up my thinking, shaking off my blinders and intensely considering whom I want to connect with. If it's people who share my passion for an area or a subject, then what comes to mind? Can I involve others who think similarly? If not to develop content with me then to help validate ideas and offer perspectives. Think of it as a means of building your personal or business brand, of helping you stand out. It tells and reinforces your story. It explains why you exist, what you believe strongly in, how you create value. It enables you to connect with potential customers. What do you think? Do you believe as strongly in creating content as I do? 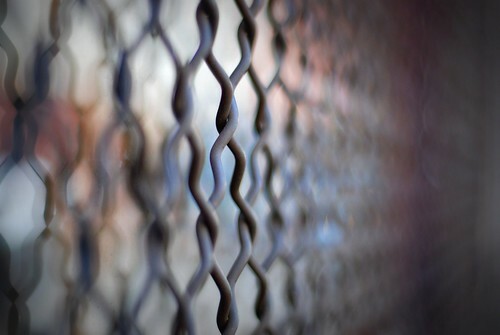 bokeh link fence originally uploaded by Will Montague. I have marvelous Links of Note to share with you! They are filled with wisdom and insight on how to make sense of all of these new, digital and social media marketing tools. Building The B2B Business Case for Social Media Marketing: A 10-Benefit Slide Show for B2B Professionals by CK makes a strong case for businesses to start engaging with customers. She offers numerous resources, including a presentation, to help make the case. 7. Sometimes, doing more means accomplishing less. Olivier Blanchard discusses in this SlideShare the Basics of Social Media ROI. It puts into enterprising perspective what matters for measuring a meaningful return on social media investment. + McLuhan, Socrates and Edith Wharton on Social Media by Joel Postman offers wise perspective from mostly dead authors. I've added this reference to Marketing Effectively During An Information Revolution. Definitely a good question. It came up during my Four On The Floor About Social Media Marketing interviews with Dave Foster [Part III]. 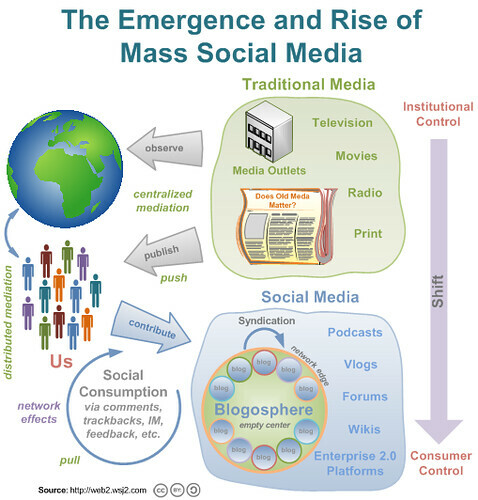 How relevant is social media to a category like floor covering with such a long purchasing cycle? If customers are in the market for a new floor on average every 5 – 7 years, what kind of dialog do I, as a dealer, have with customers and how does it result in additional business for me? Do I get a meaningful return for that effort. My response - no surprise - is that social media is definitely relevant to a category like flooring which is complex, has a long repeat purchase cycle and represents a significant investment. Not unlike plenty of other categories - like cars, roofs, appliances, computers, ... I bet you can think of plenty more. You don't believe me? Stay with me. There are three assumptions that I need to spell out. One is that you consider that your business is about more than just a one-time transaction. The other is that you really care about your customers and appreciate that your product or service fits into their bigger picture -- think home, lifestyle, community or general environment -- and enables them. [Isn't flooring a support base for living?] And, you must believe that loyalty is a driver of profitability. Getting back to the relevance of social media to categories like flooring. Complex products require education. What better way to educate than by using social media? Look at how WiseGrass uses its blog to conduct mini-seminars about lawn maintenance. Or how the Mayo Clinic uses video to communicate the expertise of its physicians and researchers and shares those via social media platforms. Building relationships with customers uncovers opportunities. Despite the long repeat purchase cycle, how can any retailer know that a customer looking for one flooring solution doesn't have other flooring decisions waiting to be made? That was certainly the case for my Mother. She intended to redo more floors, but was so disgusted with her experience after re-flooring 3 rooms that she vowed never again to go through it. Imagine, though, had the retailer kept in better touch with her, asked questions about her experience, explored suggestions on how to improve her experience, and got her talking about her floors... At least one more sale would have ensued from her, not to mention sales to her friends. Traditional tools combined with social media tools like Google local ratings and rankings would help you hear about unhappy situations. By hearing about them, you have the opportunity to fix them. By sharing this information in a public forum, you communicate to future customers how seriously you take customer satisfaction! Blog comments offer a similar forum for communication. Or, invite customers to be part of your e-Newsletter list or Facebook page to communicate directly with them. Flooring changes often trigger other purchases. What about assembling a network of related retailers to help with those needs? You could use social media - think blog or Facebook Fan Page with links to your network - to explain why you chose the service providers you did and promote success stories that you all contributed to. Not only would you generate goodwill, but also amazing word-of-mouth. My favorite, though, has to do with maintenance. As complex and significant the investment, flooring rarely comes with detailed care instructions. And, in many cases, how a consumer maintains [or doesn't] her purchase may invalidate a warranty. Although you will find care information online, much of it is confusing and not always credible. Imagine the opportunity available for strengthening relationships and building loyalty by offering customers and visitors a wealth of reputable flooring care tips and recommendations for maximizing the original investment. This can be accomplished via your website, a blog, Facebook and also video clips [e.g., check out my video of Annette Smith demonstrating how best to remove a carpet stain]. So, do you believe me? Do you see how social media can be relevant to categories like flooring?